What are problems of jaw crusher and hammer crusher in iron ore crushing plant? NewsHome > News > What are problems of jaw crusher and hammer crusher in iron ore crushing plant? With the fast development in metallurgy and mining machinery industry, iron ore crushing plant is getting more and more important. Iron ore crushers are consisted of primary jaw crusher and fine hammer crusher in iron ore crushing plant. After being crushed by hammer crusher in iron ore crushing plant , we will do the dry cleaning operations directly. Great Wall Company research this operation mode and find it cause a huge cost and resource waste, we analyze and explain the problems and solutions in the following. 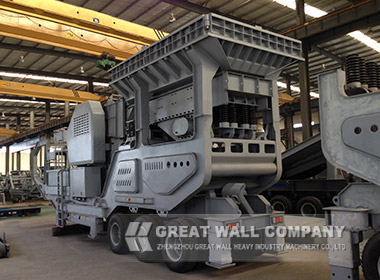 First of all,jaw crusher can not play a full performance.Some of energy consumption are waste in iron ore crushing plant.because of hammer crusher is fine crushing equipment and it has not so large crushing capacity as jaw crusher, we can process iron ore into 30 mm by two sets jaw crusher. On the second, we can adopts jaw crusher, cone crusher and VSI sand making machine as primary, medium and fine stone crushers in crushing plant. We should consider the production cost from long run, the three stages iron ore crushing plant can greatly reduce spare parts investment and gain more profit in the production line. Previous: How to do jaw crusher design calculation on basis of innovative technology? Next: How to reduce environment pollution for jaw crusher in stone crushing plant?